The Paris-based satellite communications firm announced the anomaly early Friday, just hours after a seemingly flawless launch was declared successful after deployments of two payloads. Vanessa O'Connor, a Eutelsat spokesperson, said Friday the W3B spacecraft was a total loss and the company would be filing an insurance claim on the satellite. The craft was covered under a multi-satellite insurance agreement, but O'Connor said the Eutelsat was not yet discussing specific monetary figures for the claim. 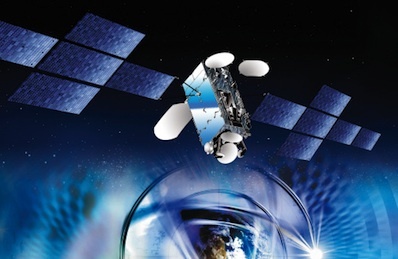 Eutelsat will not incur any direct financial loss after the anomaly, the company said in a statement. According to O'Connor, engineers discovered a leak in the satellite's oxidizer system "early in the night" Thursday. W3B carries on-board tanks of propellant to power an apogee engine designed to raise the satellite's orbit from the Ariane 5 rocket's drop-off orbit to a permanent location 22,300 miles high. After launching from French Guiana at 2151 GMT (5:51 p.m. EDT), the 16-story rocket released two communications satellites in a geosynchronous transfer orbit with a high point of 22,312 miles, a low point of 155 miles and an inclination of 2 degrees, according to Arianespace. Officials planned a series of engine burns on W3B to boost its orbit in the next two weeks. Thales Alenia Space, the satellite's manufacturer, planned to oversee testing of the spacecraft before handing over control to Eutelsat by the end of December. W3B is based on the Thales Spacebus 4000 C3 satellite platform. It weighed more than 11,800 pounds at liftoff and had a design life of 15 years. Thales Alenia Space officials did not respond to questions on the W3B mishap Friday. An Arianespace spokesperson said their engineers noticed no problems during Thursday's launch that could explain the trouble with W3B. "We had a very smooth flight and the telemetry of the launcher does not show any anomaly," said Mario de Lepine, a spokesperson for the French launch provider. Officials will continue reviewing data from the Ariane 5 rocket, according to the spokesperson, but so far engineers see nothing that points to the launcher's culpability. The mission's other payload, Japan's BSAT 3b broadcasting satellite, is healthy after Thursday's launch. Thales and Eutelsat managers are assessing disposal options for the stranded satellite, which is expected to provide no usable life if it can even reach its operational orbit. Controllers were still in communications with the spacecraft Friday evening, but telemetry from W3B is trickling to the ground at slow rates because it is not always in range of ground stations, O'Connor told Spaceflight Now. Eutelsat announced it was immediately starting development of a replacement satellite named W3D for launch in the first quarter of 2013. Company officials have not selected a supplier for the new spacecraft. W3B was supposed to begin operations at 16 degrees east longitude, picking up services from three satellites. Its Ku-band and Ka-band communications payload was expected to reach direct broadcasting customers in Central Europe, Madagascar and other Indian Ocean islands. Another target of W3B's mission was to relay data and Internet services to sub-Saharan Africa. In the near-term, W3B's lost capacity will be replaced by W3C to be launched by a Chinese Long March rocket next summer. "The loss of W3B is a disappointment for Eutelsat and for our customers. We share it with our partners, in particular Thales Alenia Space and with the insurance community," said Michel de Rosen, CEO of Eutelsat. "Our attention is now focused on delivering the W3C satellite to 16 degrees east in mid-2011 and on initiating a new program to compensate for this loss." Eutelsat dispatched W3B to the 16 degrees east location to replace W2M, a joint Indo-European satellite that was crippled by a power system failure shortly after launch in January 2009. The leading communications firm will continue using the aging Eurobird 16 and SESAT 1 satellites, along with W2M, to meet demand at the 16 degrees east slot until the launch of W3C.